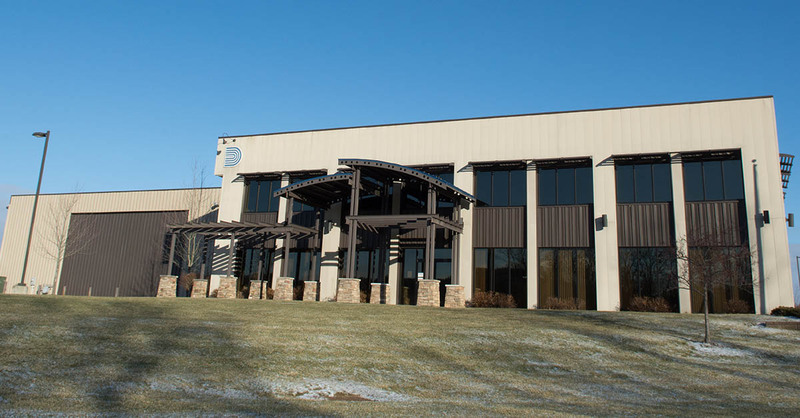 Increased demand over the past 5 years spurred the search for a larger production facility, and the founding partners thought they had found the perfect upstate location in Middletown, NY. They even secured a $400,000 grant through the New York State Economic Development Authority for expansion within the Mid-Hudson Region. Unfortunately, as the process progressed, the capital investment required to make that location work proved unsustainable. That’s when Sfoglini found the near 40,000 square foot available space in the Greene Business & Technology Park (out -grown by Ducommun Aero Structures) and made contact with the Greene County Department of Economic Development & Planning who interfaced with the Greene IDA. 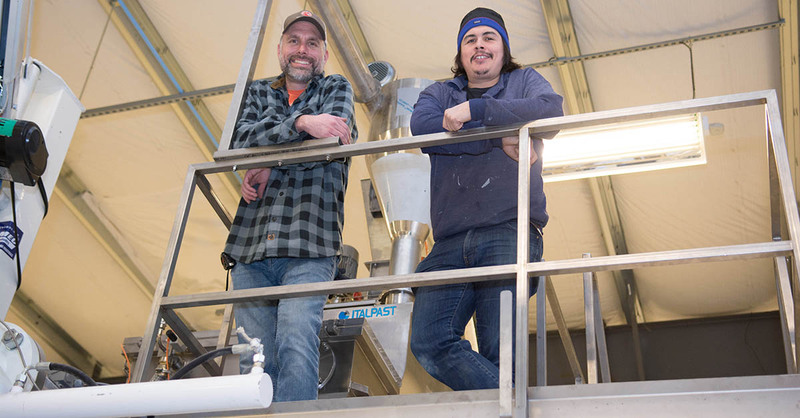 “The space was a big part of why we chose to locate in Coxsackie” recalls Steve Gonzales, “It already had the electrical and water infrastructure we need for production”. 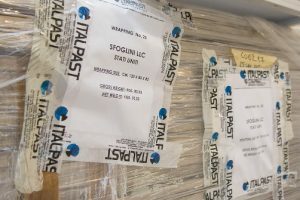 However, a big part of the expansion was the purchase of 27 tons of specialized machinery required to make Sfoglini’s traditional Italian-style pastas. The state grant was meant to help with those costs, but it had been awarded for a site in Orange County, not in Greene. The teams at Greene County Economic Development and the Greene IDA worked together to have Sfoglini’s NYS Grant re-assigned from the Mid-Hudson Region to the Captial Region to accommodate the Coxsackie, NY Location. 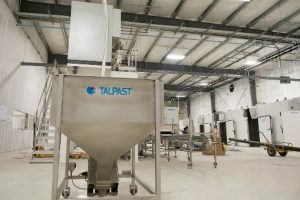 By February 2018, the space had been procured and the ITALPAST manufacturing system arrived on-site. 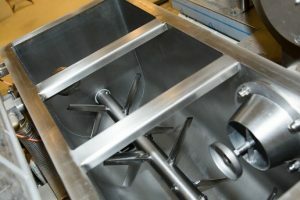 The grains for each batch of pasta are loaded into a holding hopper at the beginning of the production line and pass through three mixing systems that combine liquids and other natural ingredients to achieve the desired consistency extruding each unique pasta shape. 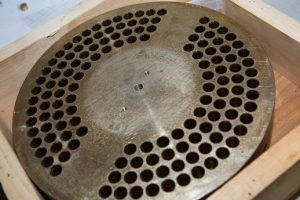 The extruding die itself is milled from solid brass, over a foot in diameter and 4 inches thick, which is custom-made by a 3rd generation, family-owned tool maker in Brooklyn. 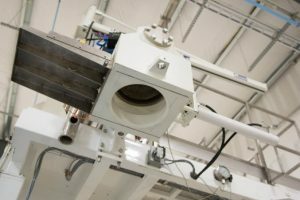 The die is so heavy, it requires a dedicated chain-motor to lift it into the extruder at the start of each new production run. 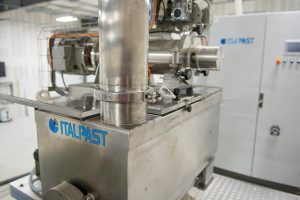 Once the pasta is formed, it is transferred through a drying system, and automatically loaded onto racks which are sent to a series of climate-controlled drying rooms to prepare the product for packaging. 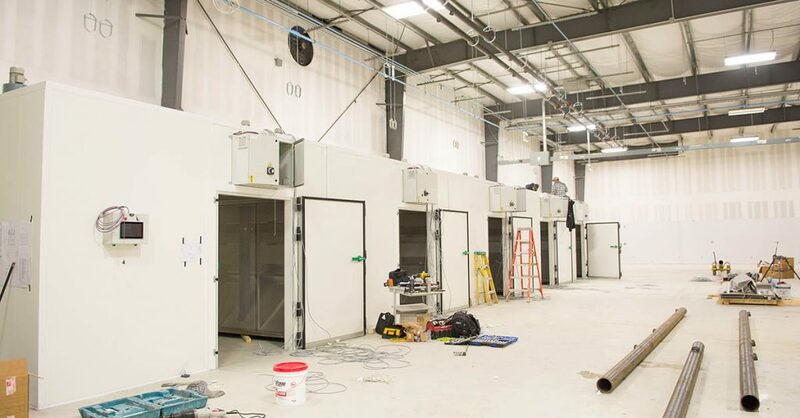 The build-out of the production facility is proceeding rapidly and expected to be on-line by April. The factory will create 10 new Greene County Jobs to start, expanding to 20 once all production equipment comes on-line. Sfoglini’s traditional offerings include sixteen organic durum semolina pastas plus a series of New York State grain pastas made with organic whole-grain, rye, emmer, einkorn and spelt flours. In addition to their signature pastas, Sfoglini produces a line of seasonal pastas made with fresh, local ingredients from green markets and local farms. Sfoglini also experiments with other unique ingredients and partners to make innovative, original pastas including a tomato leaf pasta collaboration with Riverpark restaurant and a beer pasta using milled grain from the Bronx Brewery. Sfoglini pastas are available fresh or dried and are being served at revered New York restaurants such as Tom Colicchio’s Riverpark, Chef’s Club by Food & Wine and the Mandarin Oriental Hotel. You can find out more about expanding or relocating your value-added manufacturing business to Greene County, NY and get concierge service through Business Support Programs by contacting the Economic Development team at 518-719-3285.